Just a few hours after pounding Toronto pitchers for thirteen runs, the Red Sox offense was held in check as the Blue Jays beat Boston 3-2 Saturday afternoon at Rogers Centre. 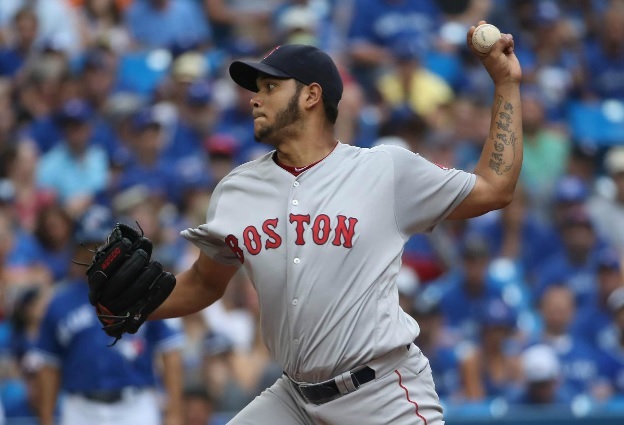 Eduardo Rodriguez (pictured) allowed three runs - two earned - over six innings on four hits and a pair of walks. Meanwhile, J.A. Happ held the Boston bats in check, allowing single runs in the sixth and seventh innings. Dustin Pedroia hit his thirteenth home run of the year for Boston's first run; Jackie Bradley Jr. drove in the second with a sacrifice fly. The win snapped a Toronto four-game losing streak and moved the Blue Jays to within one game of the first-place Red Sox. who will turn to Clay Buchholz Sunday for the series win.